Hi, You are Welcome to rv90.org and you can post your vanvan's photos. Hi Sizam :-), yes I would like to post the photos of my 1975 rv125 tracker, but to tell you the truth I don't know how to. Can you please tell me how, what size, etc. here to put your photos ! Glad to have you on this site. Anyway here comes the photos of my recently purchased RV125 Tracker from the U.K. Received the bike about 4 weeks ago through lorry transport service from the U.K now it's being steet legalized. It should be ready with licence plate in a couple of weeks. Can't wait to give it a nice street ride. Yes after a week of carfully looking at my new beauty I understood what you ment with "Aside from the Flashing"! 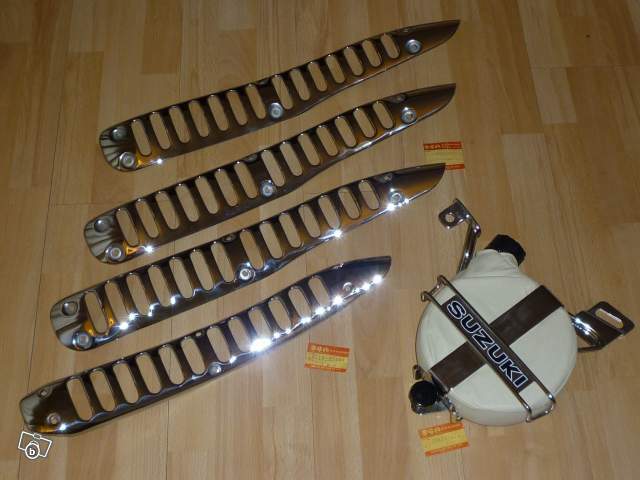 A set of new Suzuki RV125 Turn Signal Lights are on there way from the US for her. Pitty that the English Gentleman!? :/ didn't advise me. Again I am new member at this wonderful world of the RV's but certainly each day is developing my love to this machine. and will try to make it as original as possible with my economies. Anyway Simzam or other members would it be possible for you to advise me where I can purchase an external Suzuki Sub Fuel Tank with all accessories to mount on the bike. Would certainly like to buy one. Found an excelant photo on the forum to show but can't seem to fint it now. Ma que bella, ma que mille bella!!! You can also ask for translation in my post or in the others, its not a problem, we will do it for you anytime!!! 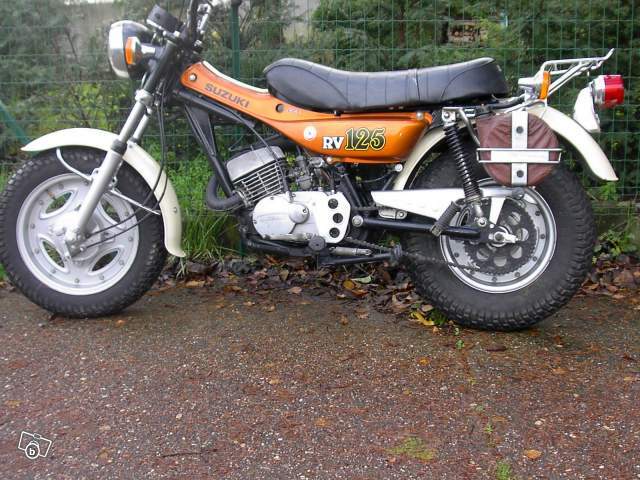 And i love "o rei do francos"
I migth come to France with my 1975 RV125 Tracker attached to my Camping Car during this September Holidays but have to make out the motorcycle support first. Suzuki Sub Fuel Tank with all accessories but can't seem to find one. If anyone could inform me where this can be bought I would appreciate, or maybe translate in French to post on Forum!? If you ever find one you'll make many jealous and you'll have to spend a lot of bucks. Try to googelise the part number: 44100-27820. I will continue looking to see if I can find one. I don't recall who, but someone here planed to have pattern ones made in China. Maybe he will recognize himself and tell you more about this project. Yes that would be great. Even if someone had the respective "Blueprints" with measurements etc. this could be made out. Personally I work with a group of Portuguese Artisans who dedicate their skills in copper (www.al-ambiq.com), if they had these measurments they certainly could have this made out both the tank and respective accessories. Calling all RV members that do have one of these Suzuki Sub Fuel Tanks beauty's to post on the Forum respective measurements and any additional information needed in order to have these manufactured. Hi Matguy, Thank-you for your comment ! Hi Lusitano , i project to reproduce the sub tank for Suzuki and other option as central stand (Rv125), front carriage for Rv90 and others goodies.